It’s finally time to start thinking about your new year’s resolutions. You’re probably getting into the holiday mood full swing by now and you ask yourself “Is there really the need to plan think about new year’s resolutions?”, thinking they’re mostly backlogged from last year. Then again, you wouldn’t want to spend another year getting nowhere or making little progress because you know this could go on for a few more years. No time to waste and let’s get planning! Here are some pretty good ideas to include into your new year’s resolutions. This is probably found in everyone’s new year’s resolutions that are unfulfilled most of the time. Let’s be honest — it is indeed hard to get back in shape and sometimes our willpower falls in defeat to 365 days worth of excuses. Learn a new set of skills! Whether playing the harp, speaking Korean or picking up coding was something you always wanted to do, add it to your to-do list. If there are some other skill sets that you would want to learn to make a living, LinkedIn has put together a list of the top 10 skills that are very likely to land you a job! Before even thinking of making your money grow to more money, the key to successful financial management is to save. If you tend to spend more than what goes into your bank account every month, you’ll find yourself overspending and drowning in debts no matter how much you earn. Be someone that your future self would thank very much — start a fixed deposit account for yourself and start saving for the rainy days. Alternatively, you can start using free apps to track your spendings. Throwing away things can be difficult sometimes. There are sentimental values attached to certain items we deem as prized possessions, and it is common to keep and bring them along throughout phases of our lives. While storing things sounds far from harmful, research has proven that you should put them behind as it does not do your mental and physical health any favours. A study by Princeton University Neuroscience Institute shows that having unused things laying around your home actually contribute to your stress level, and a messy environment could be the reason why you are always tired. Volunteering can be addictively rewarding. Restoring joy in the lives of the underprivileged will indirectly restore joy in your life, too. Certain volunteering experiences adds value to your CV, such as Teach for Malaysia, EPIC Homes, Raleigh International and MYCorps. So if you are looking to build your interpersonal skills and gain professional experience, adding volunteering to your 2017 resolution would be splendid. Now that you’ve got some ideas to add to your resolution, we’ve found some ways to help you keep track of them! To gain traction on your resolution, it has to be aligned with what you are passionate about or something that you stand for. If you have added “Have rock-hard, washboard abs by year end”, you’re going to need a damn good reason to keep yourself pumped up to check it off your 2017 resolution. Having said this, a strongly grounded purpose compels you to stick to your goals and and would probably give you the extra push you need to do those extra TRX planks and crunches. Get into the fine details. Ask yourself how much time you would want to commit in volunteering or how frequent you would want to attend classes to learn a new music instrument and where would you like to learn from. Be it formal classes or just from the internet, remember to be specific. Doing something out of your comfort zone is tough enough and imagine having naysayers buzzing “NOPE” all around. Tragic, isn’t it? Surround yourself with people who are supportive of your goals. Choose to be in a conducive environment that allows you to learn better. If you are going to learn new language, try watching TV shows of that particular language and practice among your peers who are working towards the same goal. We tend to get super pumped up for the new year with a list of resolutions that could be quite extensive and ambitious. Of course, there isn’t anything wrong about being ambitious, but it is good to focus and prioritise on what’s important. Don’t forget to give yourself a reasonable timeframe to accomplish them. It’s always cool to have apps and stuff to list your new year’s resolutions, but it is proven that writing down would increase the probability of achieving goals by more than 70%. You’re welcome. Most of us are result-obsessed creatures, and we want results almost instantly. Remember the time you did some sets of planking and checked for your non-existent abs in the mirror? Let’s be reasonable here. Rome wasn’t built in a day and neither will you be speaking French like a Parisian in such a short span of time. Mistakes are necessary for progressive learning, so don’t be afraid to screw things up. Trial and error works well, but the main key here is to anticipate failures and be patient. When the results start kicking in, you’ll be motivated to keep moving on even more! That would be all from us at GoCar. 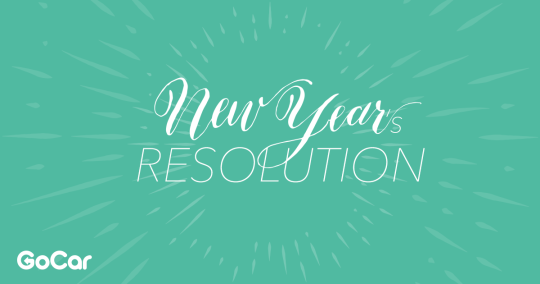 Share your experiences sticking with your new year’s resolutions by leaving us a comment below. Previous PostPrevious The Ultimate GoCar Christmas Playlist! Next PostNext Pick up a GoCar in Langkawi Island!